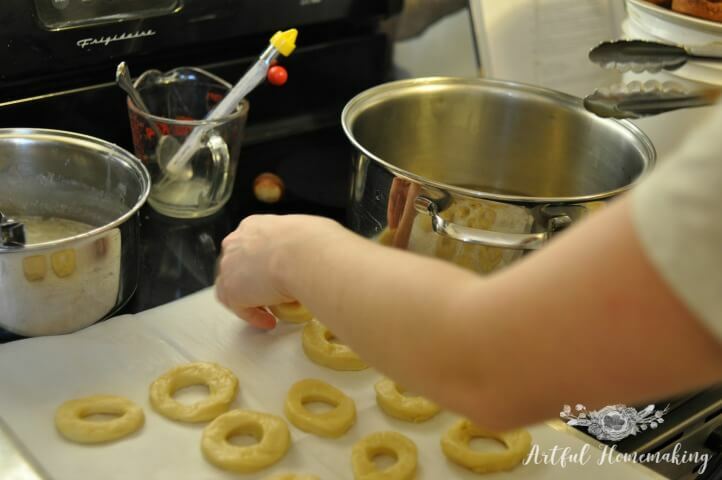 How to make homemade doughnuts, with a simple recipe! I have happy memories of making homemade doughnuts. My parents would gather us into the kitchen and then we spent the evening making doughnuts together. I tried to recreate this experience with my children when they were young, but frying doughnuts seemed too stressful back then. Instead, we had always made baked doughnuts instead of fried ones. 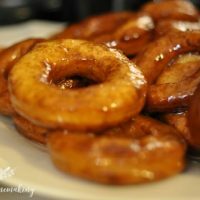 Now that our children are older, my husband and I thought it would be fun to have another doughnut-making day, but this time we would actually fry them. Our homemade doughnuts were a success! Even though some of them turned out a bit too dark, and none of them looked perfect, we had a wonderful time together, and they were delicious! 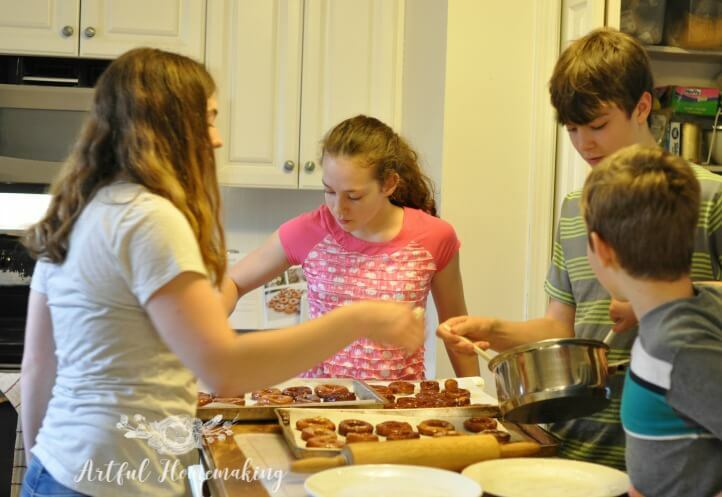 Making homemade doughnuts together is a great activity for family night. We loved it so much that we plan to make Doughnut Day another one of our family traditions. 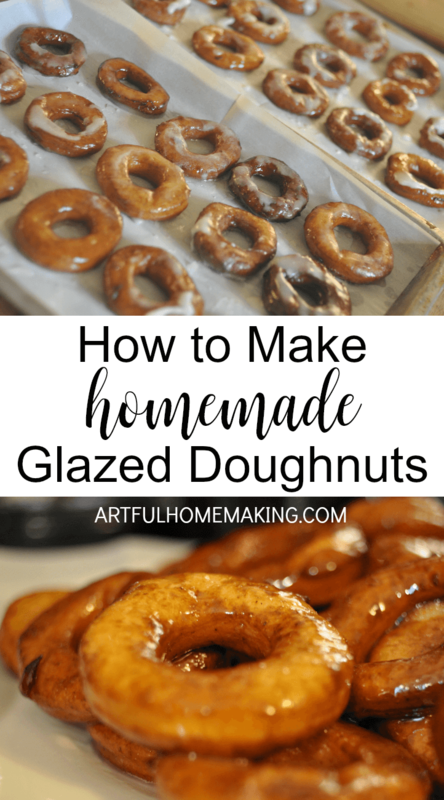 If you’d like to learn how to make homemade doughnuts, I’ll share the recipe we used below. I think it’s pretty important to use a candy thermometer for this project. If you let your oil get too hot (a really easy thing to do), the doughnuts will burn (ask me how I know!). It’s also a really good idea to divide up the tasks so everyone has a job. Once your oil is hot, the whole process moves very quickly, and it’s helpful to have lots of hands helping. We let the younger children roll out the dough and cut out the doughnut shapes with the doughnut cutter. Don’t forget about the holes! They were a favorite with all the kids. My husband and older daughter took care of the frying duties. The oil gets really hot, so you need to use caution if you have younger children around. We made a simple glaze for our doughnuts, but you can also just put powdered sugar and/or cinnamon on them. I got the glaze a bit too thin, so they didn’t seem very well covered. We decided it would be a good idea to drizzle extra icing over the finished doughnuts. As the icing cools, it will form a traditional white glaze over the doughnuts. 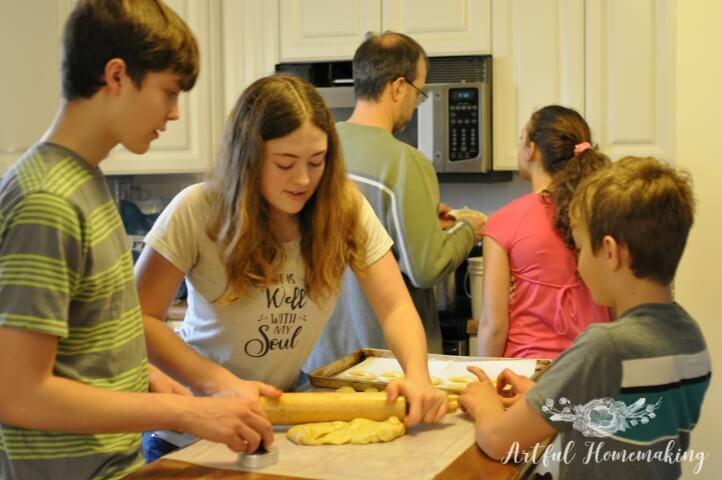 Everyone agreed that this was a really fun family project, and we plan to make them again! My oldest daughter wasn’t home when we made them, so we saved a pile for her. Even though they didn’t look perfect, she agreed that they tasted amazing! 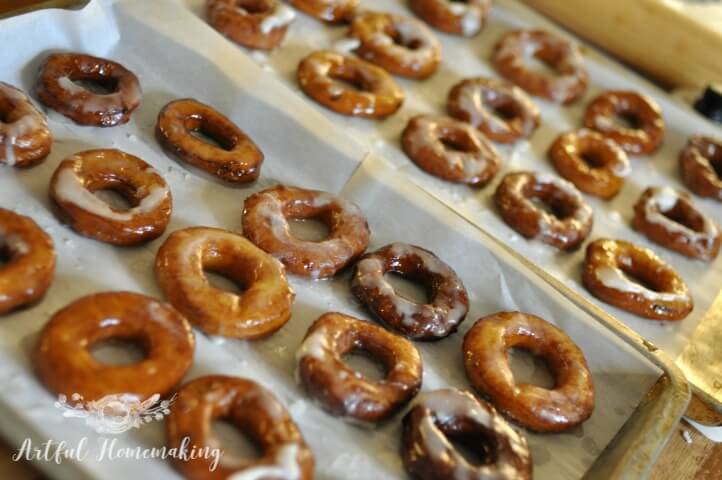 How to make homemade doughnuts! This is a great family project because there are lots of steps, and each person can help! 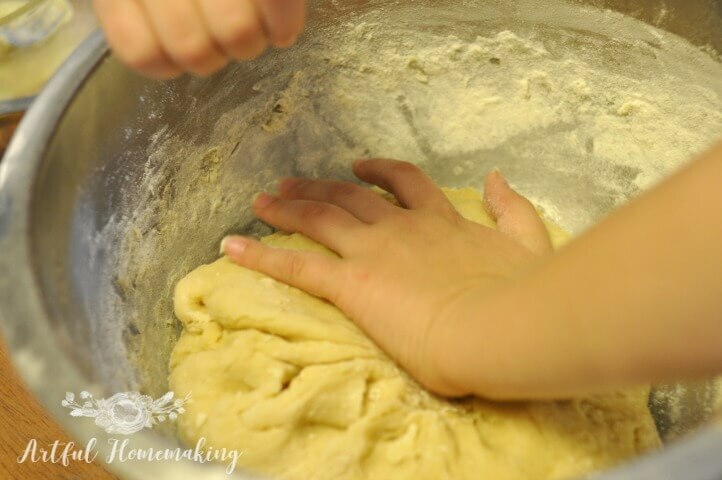 Just be sure to be careful around the hot oil (this is a job for an adult or a teenager), and let the younger children help roll out the dough and cut the doughnut shapes. Combine shortening and milk in a saucepan. Heat until the shortening melts. Set aside. Prepare instant mashed potatoes (you can also use regular mashed potatoes, even leftover ones from a previous meal). Set aside. In a separate bowl, combine 3 cups of the flour with sugar, salt, and yeast. Add the warm milk and shortening to the bowl with dry ingredients. Add beaten eggs and mashed potatoes to the bowl. Add remaining flour, one cup at a time, until you have a soft, slightly sticky dough. Be careful not to add too much. Grease hands and knead the dough. Knead for a few minutes, making sure the dough remains soft and slightly sticky. Roll dough out on a greased surface. Roll out to about 1.5" thick. Use a doughnut cutter to cut out the doughnut shapes. 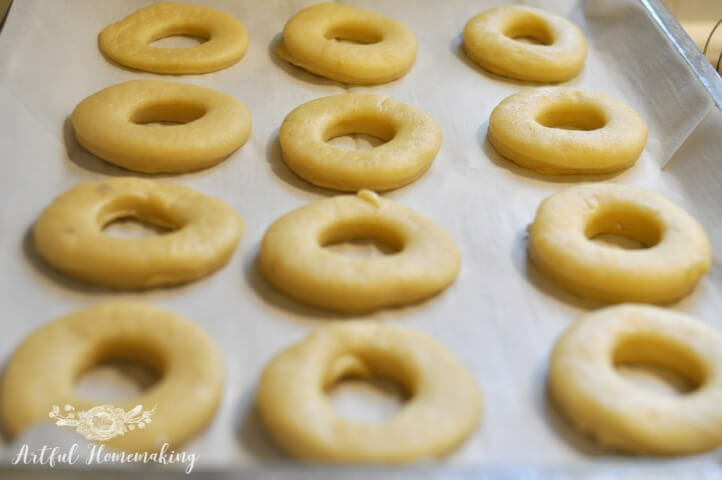 Place doughnuts on baking sheets lined with parchment. Set the baking sheets aside and let rise while you cut out the rest of the dough. Make the glaze. In a small saucepan, mix confectioner's sugar, cornstarch, and vanilla with enough hot water to make a thin glaze. You don't want it too watery. Keep warm on lowest heat setting, stirring occasionally, until you're ready to glaze the doughnuts. Heat oil in a deep saucepan over medium high heat to 375 degrees F. Use a candy thermometer to make sure the oil is the right temperature. You can also test it by dropping a piece of the dough into the oil. If it's ready, the dough will turn brown in 30 seconds. Carefully drop doughnuts into oil. Brown one side, then turn over quickly with tongs, and fry on the other side until golden. Don't let your oil get too hot, or the doughnuts will burn. Be careful around the hot oil, and don't leave it unattended. 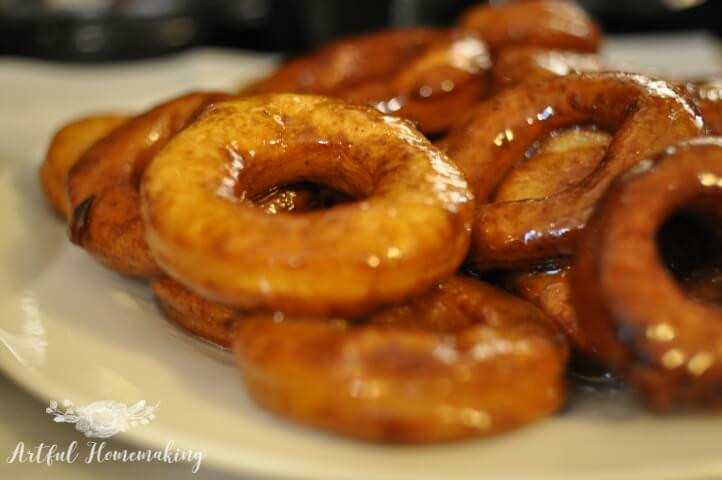 Remove cooked doughnuts from the hot oil with tongs, and lay them on a plate. While they're still warm, dip them in the glaze and lay on parchment paper to dry. We had so much fun learning how to make homemade doughnuts together. Definitely a happy family memory and a new tradition! This post contains affiliate links. Read my full disclosure policy here. Sharing this post here. Mashed potatoes?? Hmmm interesting. We will need to try this. I know it sounds weird! I first learned about it from a former Amish friend. I bet those were delicious! I don’t much care for the donuts found in most donut shops but I bet I’d gobble these right up. Pinned. Wow! These look so yummy! I am bookmarking this page. This is definitely something I want to try with my grandsons! These look so yummy! I love how everyone is pitching in to help make the donuts! Thanks for sharing on Foodie Friday. I’m heading over to share it on my Facebook page! Thank you, Julie! And thanks for sharing!